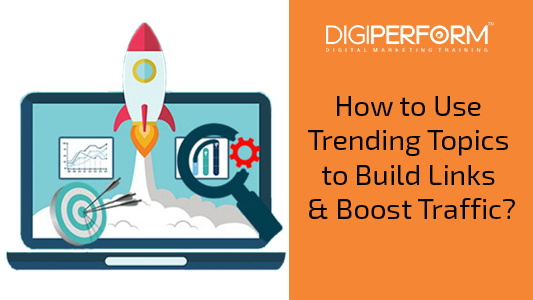 Digiperform > Blog > Business & Digital Marketing Tips > How to Use Trending Topics to Build Links & Boost Traffic? How to Use Trending Topics to Build Links & Boost Traffic? Building high-quality links and constantly driving targeted traffic to your website leads to conversions – which is what every business aims for. How? Interesting, engaging and SEO-friendly content is the key to attracting high-quality links and boosting organic traffic to your website. Content marketing is the trending marketing strategy one can use to attract traffic to the website. If we take the example of Law Firms and Dentists, this strategy is done particularly to increase the sales lead of their business. More importantly, it’s the title of the content that drags the customer or audience to read the content and learn about the brand, especially the strategy is used by people who do law firm marketing or dental marketing. Interesting content is the key to success which can be generated regularly by staying updated with the trending topics to engage your audiences. Staying updated with the current trends will help catch up with the latest story. Creating articles, reviews, video or opinion piece on the current story attracts more value, engages a wide audience and establishes your knowledge and authority on the domain. This is one of the best tools to check on trending topics. You can see the top rising searches related to your keyword and filter your search by date and region. Use this tool to see the topics that are trending in your niche and track increase in traffic for the individual topic. Track latest trends on any niche by exploring “Subreddits”. Topics like SEO, businesses are widely discussed. Engaging with other posts opens up engagement opportunities for your future posts. You can find content and stay abreast on the trends using Reddit. You can also promote your own content on this platform. Be a part of Facebook groups that are relevant to your industry. Diverse audience groups interact and you can see what they are talking about. Using hashtags is also a great way to check the current trends and news. To go a step further, you can carry out a survey of your Facebook page followers or Facebook group members to find out what they are interested in at the moment. Twitter is a hub for the trending section. People speak about social issues, celebrity issues, business, industry news, and possibly everything that you can think of. After creating a list of currently trending topics, you can brainstorm for content opportunities. Brainstorm for answers to the questions to discover and recognize content creation opportunities. Figure out what your target audience is currently interested in. Is there a trending topic or a pressing issue that can be spoken about? You can also ask them what their interests are and create content around it. Is there a gap in the current content that is floating around? If your competitors are missing out on some part of an answer to the question asked you can cover it. Check if you can cover the same news from an unexplored angle or take a fresh take on the current issue. What topics are your competitors covering? They would also be covering the trending topics. So you can cover the same topics with fresh, original and relevant content. What kind of content is more linkable in your industry? Perform a search for key terms and look for the content that has gained attention. If the content piece has several high-quality links, you can replicate the strategy and format. Developing engaging content around trending topics has high rewards. Follow the best practices to create content that will attract links and boost traffic. Choose the format for your content that has the maximum consumption. It can be a blog post, listicle, cartoon, infographics, video or anything else. People are more likely to share your content when it can be consumed fast. If you craft content for the unique audience, it would be shared with a small group of people. So tailor your content for a broad audience so the potential to share increases. This will generate more traffic and attract links. Add images, infographics, cartoon strips, videos and any other visual format that is applicable to your content type. Visual content appeals to a large audience and also encourages sharing on other platforms. Optimize your content for search engines by following the best practices of SEO. And, Optimize your content for sharing by making the share buttons accessible on your website. Include an engaging title and description, set up a featured image for the content. Since people are consuming content using different devices, it is important to make content available in a variety of formats for ease of sharing. Develop a content marketing strategy to repurpose your content across platforms that will drive the traffic and high-quality links. List out the social marketing platforms that you are active on and those platforms where your target audience is currently engaging. Repurpose your textual content into various formats. the more formats you make available, the number of platforms it can be shared on. You can implement the following ideas in your strategy. Create a slide video with a voiceover from your written content. This can be shared on YouTube. Using trending topics in content marketing has several benefits. It helps in brand awareness, brand building, audience engagement at a broad level, link building, and boosting traffic to your website. Constantly update your content marketing strategy to suit the new trending topics. Craft interesting and engaging content, and finally share it across all the platforms as suited to your online marketing. Fazeela is a Digital Marketing Executive at Bright Bridge Infotech, a Lawyer SEO company and she enjoys learning about the Digital Marketing field. She specializes in guest blogging, blog publishing, and social media. Fazeela is an avid reader and loves writing impeccable contents pertaining to digital marketing. She holds a bachelor degree in Engineering. How to Grow Leads Through Online Events? One of the informative blog that helped me to understand the strategies to improve the traffic of the site using trending topics. Thanks for appreciating our article.